Here’s the brief eulogy I gave for my friend John Delloro, Filipino American labor and community leader on Saturday, June 12 at the San Fernando Mission Rey Church, Mission Hills, California. I share the prepared version; some parts were unintentionally omitted during the actual delivery. John loved music, and one of the songs that captured his heart is “Sampaguita”*— an Ilocano song about a flower so pristine that it grew to symbolize the purity of true love. It is fitting that he loved this song because it is the language of the Manongs — Filipino American pioneers who came to the states in the 1920s — a generation of men who, because they loved their families so much, braved the coldness of the new world in search for an extra penny and a glimmer of a significant life. Like Manong Philip Vera Cruz, one of the best of the Manong generation, John also had faith in the young generation. John loved the youth for their great potential and readiness to make life significant. Like Manong Philip who organized the farmworkers, ultimately forming the United Farmworkers Union with other labor leaders like Cesar Chavez, John organized immigrants and low-income workers, ultimately founding the Pilipino Workers Center with other labor and community leaders. As Manong Philip was a shining example of his generation, so too is John an uncommon example of his. We cannot forget about John’s work, his legacy. We all need to protect it. Promote it. Keep it alive so other generations of youth may know about him, what the youth he inspired achieved together, and ultimately, what they could also be capable of doing. For those of us who are scholars, let us write about him. For those of us who are his colleagues, let us continue the work he loved so much. For those of us who are his relatives and friends, let us not only keep him in regular remembrance, but also live the life of significance he would want us to live, for he truly lived a significant life. John enflamed the human heart, empowered the human mind, and inspired the human spirit in the youth he touched. Let us celebrate John’s life so his legacy may live on. * This song was sung at the funeral of Manong Philip Vera Cruz, who passed away on June 10, 1994. Subsequent memorials for Manong Philip, especially at UCLA, included this song, too, which is how John heard it. The song had quite an impact on John, serving, in part, to pull him toward a rediscovery of the beauty of his roots. 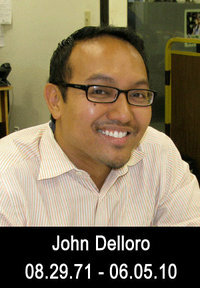 This entry was posted in filipino, filipino american, john delloro, people of color, politics, social justice by rbvergara. Bookmark the permalink.